Lammas is the first of the three harvest holidays. The work of the summer and spring is finally paying off in the first harvest. Offerings of bread can be offered to Faery folk, and left for wild animals. During this time, you may wish to honour the pregnant Goddess, and the waning energy of the Sun God, as the sun begins to fade. You can honour them by leaving libations of bread and cider. Lammas is the celebration of the first fruits of the harvest. The Sun King, now Dark Lord, gives his energy to the crops to ensure life while the Mother prepares to give way to her aspect as the Crone. Now is the time to teach what you have learned, to share the fruits of your achievements with the world. Lammas, or Lughnassadh, honours the Celtic God Lugh and may also have some association with the Roman Moon Goddess, Luna. Lugh was a God of the harvest, fire, light and sun. He was the King of the Tuatha De Danaan and the consort of Dana, the first Great Mother Goddess of Ireland. Lugh’s sacrificial death and rebirth as a sheaf of grain at Lughnasadh symbolizes that even a God must eventually bow down to his Goddess, through whose benevolence he is reborn. Other rituals on this Sabbat contain enactments of growth, birth, honour, and thanks to the Goddess from whose womb they grew, and thanks to Lugh, in his aspect as Sun God, for blessing and impregnating the womb with heat and light. This festival has two aspects. First, it is one of the Celtic fire festivals, honouring the Celtic culture-bringer and Solar God Lugh. In Ireland, races and games were held in His name and that of His mother, Tailtiu. The feast, or festival, of Lugh celebrates the triumph of Lugh over his arch-rival Balor. 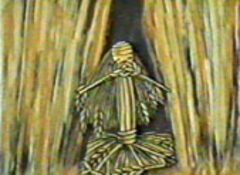 In one legend, Balor was a Sun god and, after his defeat, he descended into the underworld to heal. That is the reason why the days have begun to visibly wand at this time. Another part of that legend says that Balor was a great chieftain of a farming community and, when defeated, he was forced to give Lugh all his knowledge about agriculture, tiling and land management. The second aspect is the Saxon Feast of Bread, at which the first of the grain harvest is consumed in ritual loaves. One of the old traditions for Lughnassadh was that the King of Tara hosted a feast containing one product of the land from each province of his kingdom. This not only showed that his reign was prosperous, but also his thanksgiving for the upcoming harvest. This is a festival giving thanks for the goodness that we are about to receive. As part of this thanksgiving process, the first sheaves of ripe grain were hand-ground and baked into a loaf of break and shared by all members of the community. The loaves were shaped into forms symbolizing things like the God of the Harvest, the Goddess, the wheel of the year, or simply left round with the shape of a stalk or sheaf of wheat etched into the top. On the festival of Lammas, the day that represents the first fruits of the harvest, we also celebrate and honour the fertility aspect of the union between the Goddess and the Horned God. A centuries old custom, which is carried on today, is the making of Corn Dollies – small figures fashioned from braided straw. The Dollies are placed on the altar to represent the Mother Goddess, who presides over the harvest. Lammastide was also the traditional time of the year for craft festivals. The medieval guilds would create elaborate displays of their wares, decorating their shops and themselves in bright colours and ribbons, marching in parades, and performing strange ceremonial plays and dances for the entranced onlookers. A ceremonial highlight of such festivals was the “Catherine Wheel”, large wagon wheel which was taken to the top of a hill, covered with tar and set on fire, and then ceremoniously rolled down the hill – representing the end of summer and the decline of the Sun God. For Wiccans, the mystery of Lammas is that by fulfilling the vision of light in bringing to fruition the seed sown in the spring, we must face the vision of death. We know that the King bears the wound that he received at Midsummer and it is a wasting wound that will not heal. He slowly weakens and His creative power is spent. His powers are waning – a reflection of the failing light. But Lammas is also a time of hope, for in the cutting of the corn the seed is gathered in – the hope for life to come. We celebrate Lammas as a time of fulfillment; it is a time of joy, when we reap all that we have sown. The celebration of Lammas is a time to pause, to relax and open ourselves to the changes of the seasons so that we may be one with its energies and accomplish what is intended. Colours - Red, orange, gold, and yellow, green, citrine and gray. Candles - Golden yellow, orange, green, or light brown. Stones - Yellow diamonds, aventurine, sardonyx, peridot and citrine. Animals - Roosters and calves. Mythical Creatures - The phoenix, griffins, basilisks, centaurs and speaking skulls. Plants - Corn, rice, wheat, rye and ginseng. Traditional Herbs - Acacia flowers, aloes, cornstalks, cyclamen, fenugreek, frankincense, heather, hollyhock, myrtle, oak leaves, sunflower, and wheat. Incense - Aloes, rose, rose hips, rosemary, chamomile, passionflower, frankincense, and sandalwood. Traditional Pagan Foods - Homemade breads, corn, potatoes, berry pies, barley cakes, nuts, wild berries, apples, rice, roasted lamb, acorns, crab apples, summer squash, turnips, oats, all grains and all First Harvest foods. Traditional Drinks - Elderberry wine, ale and meadowsweet tea. It is also appropriate to plant the seeds from the fruit consumed in ritual. If the seeds sprout, grow the plant with love and as a symbol of your connection with the Divine. 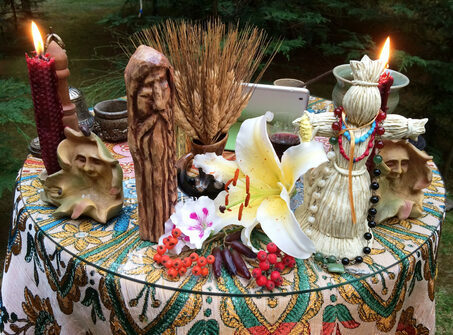 As Summer passes, Wiccans remember its warmth and bounty in the food we eat. Every meal is an act of attunement with Nature, and we are reminded that nothing in the Universe is constant. May the Lord and Lady bless you with lots of love, and a plentiful First Harvest. Lammas is the first of the summer harvests, the time of year that we honour the Corn Mother. It is a time to reflect on the harvest blessings in our lives. Think of the corn .....from seed.... buried in the moist soil of the Mother Gaia ....to green sprout...to stalk....reaching toward the sun and taking in the energy of the Sun God Lugh..... producing the ears of corn....ripening .....turning from green to gold.....swaying in the breeze...dropping it's seed into the Mother once again. Now think of your life....since the last harvest...how have you progressed and grown.....what aspects of self ...projects ... or ideas have flourished in your life. How have you harvested these or are they still in the process of growth. What bounty and blessings have come to you in the past year. Think in terms of Wealth( having enough food, shelter, warmth) Health, Opportunities, Things that have been given freely to you, Emotional support of friends and/or family, New people who have come into your life. How would you summarize these blessings. Try to encapsulate these blessings in one word or a short phrase. Remember this for later. and when you are ready open your eyes. adapted from "The Wicca Bible"
the Mother and Father are One. Bless this symbol of the abundance of Your life. Bless this symbol of the vitality of Your life.